Prepare the cake mix as per recipe on box. Place the baking cup in your temp-tations® muffin pan. Fill each 2/3 full with cake batter. Place in preheated oven and bake until the cupcakes are golden brown and spring back when touched. Allow the cupcakes to cool for 10 minutes in the muffin pan. Remove from the pan and allow to cool completely. Place the icing in a small bowl. 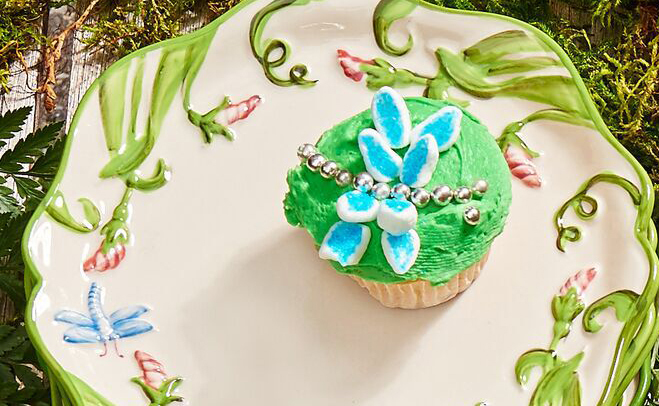 Add a few drops of green coloring and mix well to make a medium green icing. With a small spatula, cover the top of each cupcake evenly. For the wings - using kitchen scissors, cut the marshmallows in half, diagonally, across the longer side. Place the blue decorating sugar in a small bowl. Dip the cut side of the marshmallows into the sugar and press firmly into the sugar. Set aside. To assemble the cupcake, place the silver candy balls on the cupcake going 3/4 of the way across the center of the cupcake on a slight curve with the candies touching each other. Place 2 marshmallows, slightly touching, on each side of the line of candies, about half way down the line and facing slightly outward. Repeat four times to create dragonfly wings around the line of candies. Serve and enjoy!